On Thursday 9 May 2013 all Australian orchestra Ruthless Jabiru, led by conductor Kelly Lovelady, put on a remarkable and moving performance to a gathered crowd of both Australian and UK supporters at Australia House. 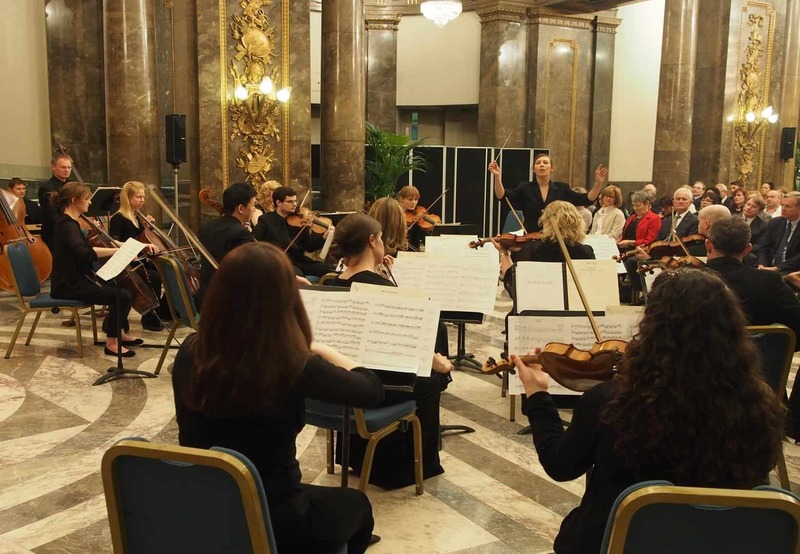 ON THURSDAY 9 May all Australian orchestra Ruthless Jabiru put on a remarkable and moving performance to a gathered crowd of both Australian and UK supporters at Australia House. Held in the lavish reception hall, the heavy brocade curtains and marble pillars set an appropriate tone for an orchestral concert. Guests were greeted with a range of Western Australian wines, before being seated for the performance. Agent-General of Western Australia, Kevin Skipworth, welcomed guests and acknowledged the generosity of Australian Business, Australian Council for the Arts and Westpac in helping to support the concert. Comprised entirely of professional Australian musicians living in the UK, Ruthless Jabiru is a unique showcase of the incredible expat talent on offer in our adopted capital. The skill and professionalism of this orchestra, and its founder and principal conductor Kelly Lovelady, was clearly evident throughout the performance, not least in their handling of the first piece — a commissioned work from UK-based Australian composer Leah Kardos, Kick. This fantastic piece evoked visions of a sunrise over an outback property, the building melodies of a single viola and violin sounding out like the Australian bush slowly waking and coming to life. Gavin Dixon, classical music critic and journalist, said the piece was a great opener. “Kardos uses a small palette of string textures, including long vibratoless pedals, tremolos and portamento slides, and integrates them into a tightly structured and impressively focussed work. The second piece, Brett Dean’s Carlo, used an overlying tape track of choral singers and whispers which dipped in and out seamlessly with the orchestra. The piece included compelling soloists from all 15 string players. The finale, John Adams’ Shaker Loops, was the most conventional piece on the programme and commenced with a string quartet building in repeating sequences to a dynamic finish with the whole orchestra. It was an incredible performance from a very talented and relatively new orchestra. With a strong programme of events in the works for the future, Ruthless Jabiru is sure to become a permanent fixture on many Australian expats cultural radar. Classical music critic Gavin Dixon agrees. For Gavin Dixon’s full review read Ruthless Jabiru Australia House 9 May 2013.